Like a scene from science fiction movie Blade Runner set in Victorian England, giant advertisement films are to be beamed on to London Underground platform walls. Replacing posters on the walls opposite the platforms from the start of next year, the advertisements will be shot across from projectors installed above passengers' heads. Full colour and even high-definition, the "cross-track projection" system will be installed at an initial 24 stations in Zone One. Fully computer-controlled, in addition to advertisements, it will also be able to beam across everything from football scores to lottery results. 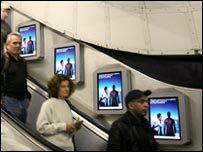 The technology, part of a £25m digital investment programme that is also seeing LCD television screens installed up and down escalators, is being introduced by advertising giant Viacom Outdoor. Viacom is bringing in the systems after recently retaining the new contract to be the sole advertising provider on the London Underground. Although no figure is being divulged for the cost of its new deal, which runs until 2015, media reports have suggested that Viacom bid more than £1bn to beat its rivals. The price is likely to be so high because with daily passenger numbers of three million people, the London Underground provides advertisers with a perfect market. In fact, it may well be the world's biggest transport-related advertising contract. "We are a global company, and I certainly don't know of a larger contract," said Viacom Outdoor's joint managing director Andrew Oldham. "The idea for projectors is that there will be between two and three per platform, with the traditional poster advertisements remaining in between, so about one in four per platform will be digital. "Although it will be a fantastic transformation - like TV going from black and white to colour - there will be no sound, so from our point of view it is the evolution of the poster rather a standard television advertisement. "Sound just wouldn't be welcomed by the customer in the underground environment, and could have also got in the way of the Tube announcements." Mr Oldham added that the projection idea had received a very enthusiastic reception from the advertising community. "It will open the door for glossier brands, and retail companies will be able to change their advertisements throughout the day." 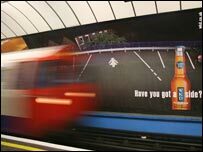 Cobra Beer, one of the thousands of firms that regularly advertises on the London Underground, has given the projectors a warm response. "It makes sense, as you have a captive audience on Tube platforms," says Cobra's marketing director Simon Edwards. "With people waiting an average two or three minutes for the next Tube train, they will have plenty of time to watch an advertisement." But would Cobra be tempted to use the new system itself? "It depends on how much of a story you have to tell in your advertisement," Mr Edwards adds. "At Cobra, we have used just about all advertising formats. "If it is a straightforward message, a traditional poster or beermat will do, but if you have something more to say, a TV or radio ad can work very well." 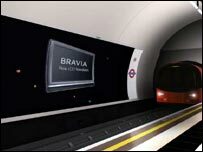 A Transport for London (TfL) spokesman said the forthcoming projection advertisements would "transform the station environment for our passengers". "We will soon offer one of the highest quality transport advertising estates in the world," he says. "This is good news for advertisers and passengers alike. "The new advertising contract also guarantees TfL significantly more income to provide for more improvements in the transport system as a whole."